Vintage MG Parts now manufacture their own P Type engine sumps which are produced in-house and made from our own commissioned patterns. We have paid particular attention to the original P Type sump profile detail to include the threaded boss on the nearside face to accept the double breather pipe clamp on late PA and PB engines. 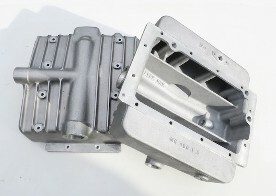 The sump patterns incorporate no less than 9 cores, and being particular on the foundry mold preparation process, they are produced to a fine quality finish to all unmachined surfaces on this LM6 casting. There is no fettling. As at 29th December 2017, we have just one sump remaining. We also manufacture sump oil strainers and sump oil strainer hex spanners for all MMM models as well as the early (short) and late (long) P Type dipstick and dipstick holder. We also supply engine sump gaskets and Wellseal jointing compound.